-Innovadesk 32x22" Standing Desk by INNOVADESK This is the solution for your back pain, and for a continue active way of leaving that you were looking for. You are never going to work in the same way after using once Standing desk -Innovadesk. Stop sedentary work because it has a direct impact on your body and health. Step forward in a new way of active working improving your productivity and consciousness by working standing with INNOVADESK STANDING DESK. -Innovadesk comes already fully assembled. It means that you just need to open your box, put it on your existing desk, and Its just the beginning of your new way of active life with Innovadesk. -Why Innovadesk is Better to other Standing Desks? 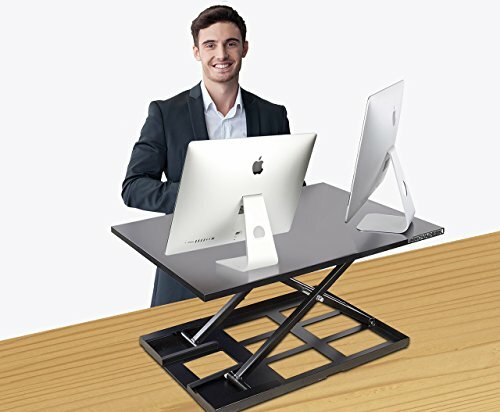 First of all, Innovadesk allows you to fix the height of your standing desk anywhere from 7 to 16 inches, giving you the exact confort for workig from your standing position. That's possible by the unique updated manufacturer technology gas spring to avoid fast dropping issue, a common problem on many other standing desks. Strong - durable & fashionable design: we incorporate robust materials and specially designed details of manufacture that maximize the resistance in the daily use of your height adjustable desk riser, and also a distinguish design. -Specifications: - Height adjusts up to 15.5 inches, and is 2.5 inches high in the sitting position Desktop surface is 32 inches x 22 inches Specially Designed to fit most desks and cubicles. -Maximum load on Innovadesk XL is 20 lbs. Desktop is made of laminated particleboard; legs and base are steel. -This is for sure the best deal you are going to made for your daily work, health and life. STRONG ADJUSTABLE STANDING DESK KEYBOARD: Sit to stand desk monitor riser INNOVADESK is specially designed for daily use of this variable high desk, incorporating robust materials and specially designed details of manufacture that maximize the resistance in the daily use of your height adjustable desk riser. People use it as a standing drawing table in any place. The desk top adjustable height can vary depending the place where you are. Excellent stand up workstation, great table laptop desk. If you have any questions about this product by Innovadesk, contact us by completing and submitting the form below. If you are looking for a specif part number, please include it with your message.